2 Atlantic Cod Filets – roughly 1 lb. Place butter and evoo in a large, heavy bottom pot on med-high heat. Place the fennel in the pot and season with salt/pepper. Cook 2-3 minutes or until the fennel starts sweating. Add the carrots and continue cooking a couple of minutes. Add the clams and shake the pan. Then add the fish filets on top of the fennel. Put the heat on high and add the wine. Immediately cover the pot and cook until the clams open up (1-2 minutes). Once all the clams are open, turn the heat to medium and cook until the fish is fully cooked. Add in the spinach and cook just until wilted. Taste the sauce and vegetables. Reseason with salt/pepper if necessary. To serve place the vegetables into a wide, shallow bowl. Place 5-7 clams around the bowl and the fish in the center. 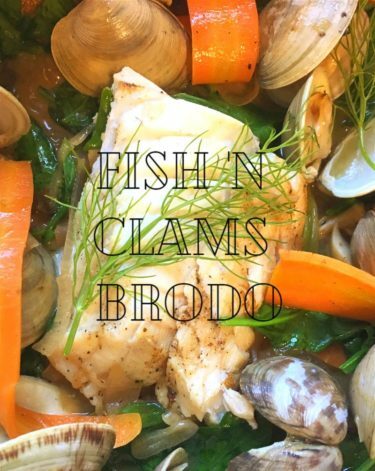 Ladle the sauce over the fish and the clams. Garnish with fennel fronds. Enjoy!